ACKNOWLEDGMENTS: The photographs and information has been kindly provided by Don Burge, a retired pharmacist, and Terry Omond OAM, curator of the Calvary Hospital Museum . Pain relief was an important part of medical treatment. The best known and oldest analgesics are derived are derived from the poppy (opiates) and the willow bark (salicylic acid). Opium was used by the Sumerians and Homer referred to it in the Iliad (900 BC). Laudanum, an opiate was often used in Victorian times. Morphine was synthetised in the early 1900. Because of the addictive effects of opium and its analogues the use was limited by the medical profession to intractable pain only. Less severe pain was managed by Aspirin, Phenacetin and Codeine. Salicylic acid (salacin) was produced in the 1830s and commercial Aspirin was developed by Hoffman in 1899 and made the Bayer drug company famous. Phenacetin was introduced in 1887 as an analgesic and antipyretic. Australia developed its own pain killers such as BEX, Vincent’s APC and Veganin. They contained a mixture of aspirin phenacetin and caffeine or codeine and were popular. The side effects of phenacetin leading to interstitial nephritis and papillary necrosis resulting in renal failure, first reported in 1970 and phenacetin was removed from the pain preparations. Paracetamol which was known in the early 1900s as acetaminophen has become more popular recently. 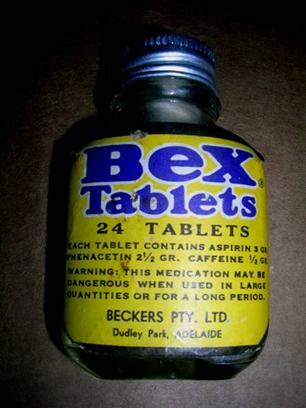 The manufacturer of BEX was the firm of Beckers in Dudley Park in SA. It is suggested that Prof. Mc. Beth from Adelaide University was associated with its development. “Veganin” was another analgesic. The caffeine has been replaced by codeine and the dose of phenacetin is higher than in Bex. The doses are still in grains. “Veganin” is no longer sold. 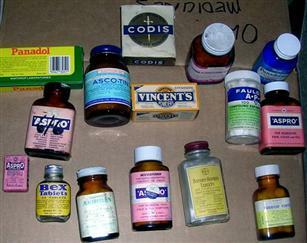 The Australian firm of Nicholas produced Vincent’s powders. They were originally marketed as “Vincent’s APC ” (aspirin, phenacetin and caffeine). Once phenacetin was found to be associated with renal failure, the composition was changed as shown in the illustration. Faulding company is well known in South Sustralia . 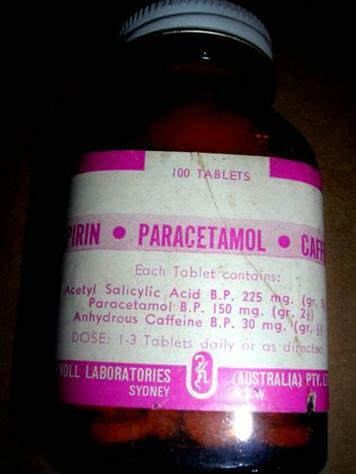 Their analgesic preparation “Faulding’s APC ” still contained phenacetin in 1960 ten years before the renal problems with phenacetin had been recognised. Re Aspirin. 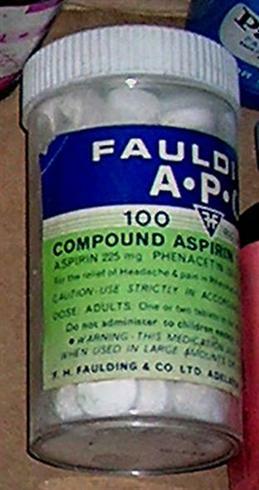 A less irritating form of Aspirin was produced by Felix Hoffman, a chemist, for the German Company Bayer in 1897. He used sodium salts as buffers to reduce gastric irritation in order to help control his father’s arthritis. 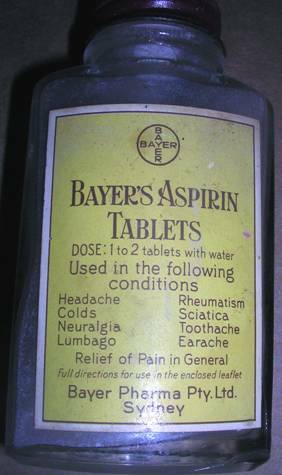 Thus Aspirin was born, Bayer patented it in February 1900 and the company is now global. 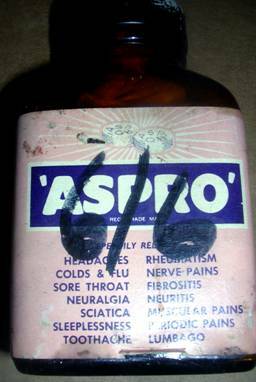 The name “Aspirin” was formed by using A from A cetyl, SPIR from the SPIR ea plant which was a good source of methyl salicylate and IN, a common suffix in medications. 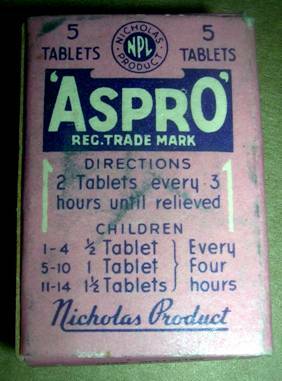 Nicholas “Aspro” (“aspirin”) showing indications. and the price of six shillings and six pence. Because of the renal problems with phenacetin and the gastric and coagulation problems associated with aspirin, paracetamol is now the commonly used analgesic.